The Slave Lodge was built in 1679, making it the second oldest existing colonial structure of the Cape Colony, today known as Cape Town. This building was changed many times and it is unclear how much of the existing building dates from the slave period. The building was used as a slave lodge until 1811 when it was changed into government offices by the new British colonial authorities. Britain occupied the Cape Colony in 1806 and their claim to the Cape was recognised in 1814 by the rest of Europe. The Slave Lodge housed the slaves who belonged to the Dutch East India Company (VOC). These slaves worked for the VOC and were never sold. Very little is known of the people who lived in the Lodge, We know what type of work they did and we know something of conditions in which they lived. We have managed to find at least half of their names, but know little more than where they came from and the date of their death. The British colonial government decided to turn the Slave Lodge into government offices in 1807. At that stage there were 283 slaves in the Lodge: 187 men, 73 women and 23 children. Many of these slaves were old and could not work anymore. The governor, the Earl of Caledon, sold some of his slaves at a public auction and the remaining slaves were moved into the western wing of the Lodge. In 1811, the remaining slaves were moved to a rented building and in 1820 to a new slave lodge in the Gardens. These 135 slaves were manumitted in 1828, six years before universal emancipation of slaves in the British Empire. 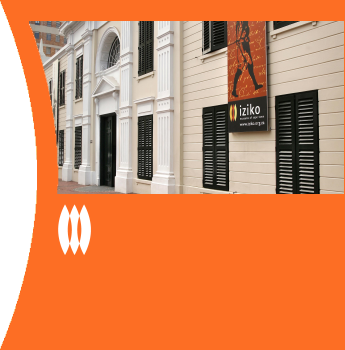 Today the Slave Lodge is a museum, managed by Iziko Museums of South Africa. It became a cultural history museum in 1966, exhibiting mainly the material culture of the descendents of the Dutch and British colonists. The role that slaves played in developing the Cape Colony was only fully recognised by the museum during the 1990s. The building was renamed the Slave Lodge on Heritage Day, 1998. Rear facade of the Old Supreme Court from Church Square, late 19th/early 20th century. The building was very dilapidated at this stage. The pediment sculpture had been created by Anton Anreith when the Slave Lodge was converted into Government Offices in the early 1800s. The building was converted to government offices, including the Master's Office, the office of the Attorney-General, the Government Secretary, the receiver of Revenue, the Bank, the Post Office, and the Public Library. 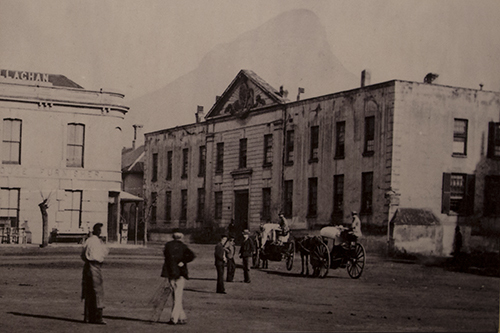 By 1817 the Supreme Court was located at the former Slave Lodge and after 1827, the builiding became the home of the COuncil of Advice and later the Legislative Council of the Cape Colony. In 1966 the building became the home of the new South African Cultural History Museum and was proclaimed a National Monument in 1967 - there were many exhibitions but the histories of slavery remained untold. Finally in 1998 the Museum was re-named the Slave Lodge; and today, as part of Iziko Museums of South Africa, a permanent exhibition of slavery is unfolding within its walls.